Polyvinyl chloride (PVC-U) is a flame retardant and chemically unreactive, material. PVC-U shows high mechanical strength, tensile strength and has the ability of continuous operation between temperatures of -15 °C to +60 °C. It can also be easily glued, cemented and welded. Although it is a rigid material, PVC-U is easily thermoformed and can be machined within close tolerances using standard working tools without difficulty. 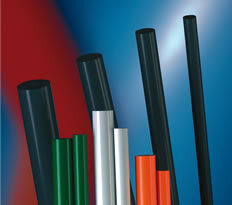 Macplas LTD is able to supply a range of PVC solutions in sheet & rod form for general and specialty use. • Increased impact strength at low temperatures (-40°C). surface resistivity ≤ 106 Ù.